The third long player of experimental recordings by John Lennon and Yoko Ono, Wedding Album was released by Apple in 1969. 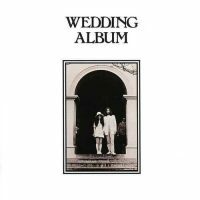 Wedding Album was credited simply to "John & Yoko"; their surnames did not appear anywhere on the sleeve or record labels. They had previously released the sound of their unborn child's heartbeat on the Life With The Lions track Baby's Heartbeat, but this was the first time they had used their own non-vocal bodily sounds in their recordings. The couple first recorded John And Yoko at EMI Studios, Abbey Road, on 22 April 1969, in a session beginning at 11pm and finishing at 4.30am the following morning. Five days later they returned to remake the track, with recording and mixing completed between 3pm and 8pm. The released version was a combination of the 22 and 27 April recordings. Lennon edited the two together on 1 May 1969. The album's second side was titled Amsterdam, and featured recordings made during their first bed-in for peace. The 25-minute track began with Ono singing John John (Let's Hope For Peace), which was later performed at the Toronto Rock and Roll Revival festival and released on Live Peace In Toronto 1969. Much of Amsterdam consisted of interviews given by Lennon and Ono, explaining their campaigns for peace, and discussions with each other. The speech was also interspersed with the sounds of seagulls, industrial noises, traffic, children playing and sitars. Peace is only got by peaceful methods. The establishment knows how to play the game of violence. They can't handle peaceful humour. As the bed-in was discussed in the past tense during the recording, it is likely that parts of the recording were made in London or elsewhere after the event. Four other musical interludes were also included: Lennon performing a brief blues-style composition on an acoustic guitar, featuring the words "Goodbye Amsterdam Goodbye"; Ono singing Grow Your Hair, a song about peace and staying in bed, with Lennon on guitar; an a capella rendition of The Beatles' song Good Night; and Bed Peace, a brief recitation of the words "Bed peace" and "Hair peace". I wouldn’t remember when john Lennon and Yoko ono got married. I was a kid back in the nineteen sixties. however, I’ve heard about this for years. I thought it was a rather interesting album! Have you ever listened to side 1 from A to Z? Now, this is voyeurism! the sort of joke you and your girlfriend may conceive. Not a lot of fun , and very predictable…John was consciously breaking his John Beatle image with this album. Side 2, however, is interesting, if only from an historian point of view, this series of edited press conferences while in bed in Amsterdam clearly states what was happening in the western world in the spring of 1969, so I’d give it one star, or apple, for side 2 only. By the way, My copy isn’t the package box, but the dutch release, quite rare I believe, cost me a fortune some 40 years ago! the sleeve pictures the Lennons kissing that probably was the blueprint of the “double fantasy” sleeve, and it opens on more pictures of John&Yoko in bed in Amsterdam. In case anyone may be interested, it’s first run of the booklet had newspaper clippings on the inside of the cover. The next run there were no clippings printed on the inside cover, only from Page 3 onwards. I had three different versions. Version 3 had no clippings till Page 4. A bit of info for collectors.